The ever-improving ratio of equipment cost relative to quality means that more or less anyone can now make a film. Whether that film is any good, and whether it merits someone else spending their time watching it is another matter. On the surface, this democratitisation of film-making is a good thing- after all, why shouldn't people get to make films? On the other hand, as evidenced by some of the less convincing efforts viewable on a You Tube video near you, just anyone can't make films, in the way that anyone can't write a novel or compose an operetta. There are standards of cinematic quality which separate the 'can dos' from the 'can nots' and the 'should dos' from the 'should nots', but, for better or worse, anyone can string a rag-bag collection of images together and refer to it as a 'movie' or- even worse- a 'short film'. Film is a language. That language needs to be understood (and preferably mastered) before entering the fray, unless of course you are Charles Hendley, the director of Shelf Life, who 'seemed to understand it' (p.270) without studying it in the first place. I for one would not dream of venturing to some far flung corner of the former British Empire with a) no knowledge of that country's language or b) no phrasebook. But, the language of film can tempt those without knowledge, phrasebook or (it seems) even common sense (and I call Mr. Hendley as my key witness here, m'lud) into translating "their dream" into moving images. I would argue that there has to be at least some underlying knowledge- some degree of comprehension of the tools and techniques of cinematic practice- to distance those who simply shoot video from those who make film. For me, it is just as inconceivable that someone could make a film without having at the least watched (and preferably studied) existing films as it is that someone could write a novel without having first bothered to learn the English language. All this said however, there is a burgeoning market in books aimed at making everyone the next Steven Spielberg- indeed, you could be forgiven for thinking that mere monetary investment in equipment and a book or two would give you all that was needed to make the next Hollywood Blockbuster. The reality is much, much different. Refreshingly, Short Films- how to make and distribute them is not a book for the absolute novice (and avoids the trap of convincing anyone who can read the book that they are bound to be The next Big Thing), but it does seem to tread an uneasy gap between feeling that films are do-able and providing a list of ten million things you-might-not-have-considered-but-might-not-have-needed-to-anyway. In short, the book seems to target itself at those that, whatever their level of cinematic literacy, have put some serious measures in place to make a film irrespective of the standard of the finished product. There are a thorough 31 chapters across a total of 300 pages (including the necessary index) dealing with everything from composition to casting and from grip gear to grading. The book also provides a useful look at the comparative merits of DV (Digital Video) as compared to film. Given the level of detail throughout, it is rather a shock to have the indispensible term mise-en-scene airily dismissed in two and a bit lines with the comment that it 'refers to how you put a scene together' (p.170). In fact, mise-en-scene is so much more, and could have usefully been introduced as a Key Concept early on before the discussions of lighting, locations and casting come into play, for those are all elements that shelter gratefully under the umbrella that is mise-en-scene. Q.- 'How do you go about finding the right kind of actors for a role? For those of us not accustomed to going out to the theatre on a thrice-weekly basis there is, it seems, no ready answer. If there is a key problem with the book at all it is exactly that- a willingness to discuss in great detail lenses and filters at the expense of, for example, a step by step advice guide following a production from inception to fruition. It is the balance between what should work in theory and what actually works in practice that makes the book seem rather unfriendly in its 'there's so much to think about' attitude. True, one needs to carefully consider many aspects when putting a film together- but so many- and in so much detail? 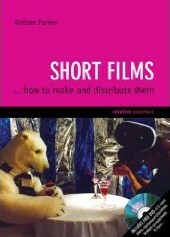 Short Films...how to make and distribute them is, as should be evident, not an easy ride. However, if film is to move away from the home video 'anyone can make a movie' world it is probably, despite its shortcomings, a ride seriously worth taking. If the intricacies of the production process prove too much, the book also comes with a DVD featuring five eclectic short films (which are all much of a muchness with the exception of the amazing Being Bad) plus four items of necessary paperwork (requiring computer access). Of the five films, Rare Books and Manuscripts failed to capture my interest, and should have been far shorter. Being Bad on the other hand was mesmeric, and I for one could have enjoyed it for longer. The director of the third film on the DVD, Shelf Life, is modestly quoted thus: '...the moment I started making films, I just grasped it' (p.270). My advice (both to the audience and to the director concerned) is to skip the obnoxious Shelf Life and watch Being Bad again. Sadly, film four, Hotel Infinity, is barely any better- and commits the first sin of short filmmaking: self-indulgence. The DVD ends with a whimper- Chrysanthemums the Word must be the only film with a longer title than its running time. Overall, the DVD is rather a curate's egg- though worth having purely for the innovatively stylish Being Bad.